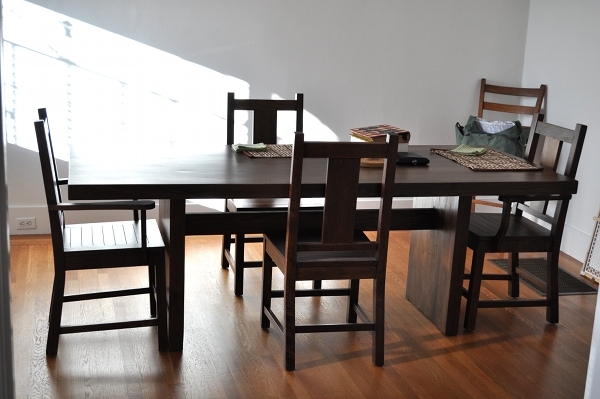 A somewhat random picture of our new dining room table. Isn't it gorgeous? Ahhh, I just deleted a post that had been going stale as a draft for several days. Obviously it wasn’t right. I was trying to convey such monumental good news that I was getting more than a little carried away. Rather than dance around the issue for paragraph upon paragraph, I’ll get right to it. Last Friday I received a phone call from the latest (and greatest) museum where I’d put in an application. They wanted to hire me! This job is so perfect, I would have been pretty bewildered if I didn’t get it. I’ll be doing very similar work to what I did before leaving Denver more than two years ago. I’ll spare the details for now. All that matters is that it’s something I love doing, I’ll be using my education, and getting some intellectual stimulation 3 days a week starting in April. Woohoo! I’ve been riding the high from that news all week, although it has been somewhat muted by a sad development in the family. Almost simultaneous to the job offer, I found out that my favorite aunt has cancer. Yes, I am not afraid to admit that I have a favorite aunt (and yes, I do have several to choose from). This happens to be the aunt I’ve been closest to growing up. Lee and I visited her last weekend. I brought homemade Peanut Butter and Nutella Cookies from a Back to Her Roots recipe via a Foodzie Baking Box (These were some seriously good cookies. Make them!). 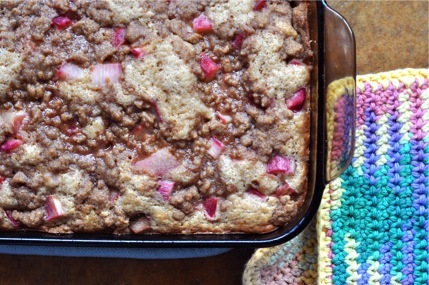 Of course, there was already a fresh-baked apple crisp on the counter when we arrived. I wonder where I got my penchant for baking? No one knows much yet but we are all hopeful. Focusing on the positive: you might wonder why my job doesn’t start until April. The delay allows Lee and I to take our boat relocation trip that we’ve been planning for a long time. We have to move Pirat out of the hurricane minefield and into a more secure boat yard. Here’s some quick stats on the trip, in case you’re curious, and you can always check out our sailing story and my eventual posts on this leg over at Pirat. Projected Wind and Sea Conditions: 15-25 knots of wind and 6-8 foot, steep or very steep seas, both from behind us. As you can imagine, I’ve been very busy getting ready for our trip this week (we’re leaving next Tuesday). Among other things, I needed to use my sourdough starter! Isn’t that a high priority before going away for 3 weeks? I really didn’t have time for any elaborate bread baking so I threw together some sourdough muffins this morning. I am thrilled that something I totally made up finally came out well! It seems like I’ve produced more flops than successes in my kitchen of late. This time, I wanted a comfort muffin. I wanted lots of whole grain heartiness that I know will be difficult to come by in the Caribbean (they are really into their fluffy, sweet bread down there). I also wanted to use up some of the perishable foods in my fridge. On all counts, these muffins were a success. Just a little disclaimer: my measurements in this recipe are approximate, except when it comes to the bran and flour, which I weighed. Don’t ask me why I wasn’t as precise with everything else! I fed my sourdough started with 1 cup all purpose flour and 1 cup water the night before. 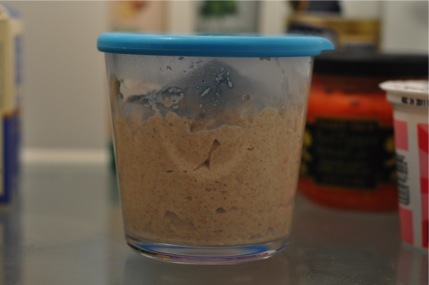 In the morning I refilled my starter container and use what remained from the feeding for this recipe. It looked like between 1 and 1.5 cups of starter. More starter would probably just make the muffins more most and a little more sour. Mix the brans, flour, and salt in a medium bowl (I just add them to the same bowl on top of my food scale). Combine with the sourdough starter in a large bowl and stir until fully mixed. 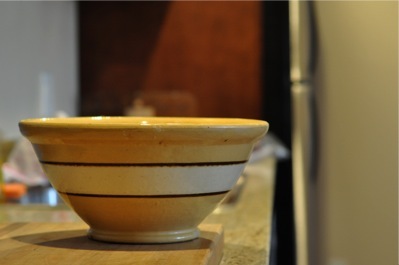 Cover bowl and allow to sit for an hour or two. In a medium bowl, beat eggs, applesauce, sugar, oil, cinnamon, and baking powder. Stir in vanilla extract and prunes. Spoon batter into a prepared muffin tin and bake for 18-20 minutes, or until muffins are firm. 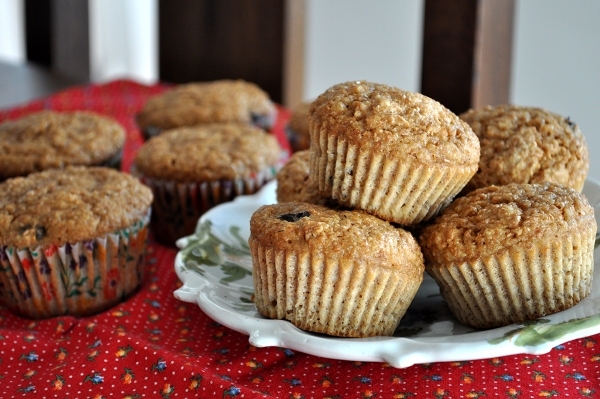 Remove from oven and cool muffins on a wire rack. I have a lot of food boundaries. Some of them are more like barriers (I think this term has a slightly negative connotation) and some are lines that I think it’s better not to cross. I spend a lit of time breaking down the barriers and testing the boundaries of my cooking and eating habits. Comparing now to my eating disordered past, I think I only have my big toe dipped in the food restriction waters, while I was up to my neck several years ago. Still, old barriers remain and I chip away at them every day. Take cheese, for example. I used to eat the most processed, light, fat-free, bleugh cheese ever, and then only in minuscule amounts. Right now, I have exactly 5 kinds of cheese in my refrigerator…wait, make that 4. I finished the feta for lunch today. I love cheese and I’ve learned to eat real-food kind of cheeses (no more nasty processed stuff) in reasonable amounts. I could go on but I think one confession is enough for one post. Oh, but then there’s the whole reason I started talking about boundaries/barriers in the first place: Pie filling! You know the stuff in the can that you can just pour into a crust and voila, you have a pie? I don’t think I had ever bought or baked with canned pie filling until Duncan Hines sent me coupons for their baking mixes as well as Comstock Wilderness Fruit Fillings through the Foodbuzz Tastemaker program last month. Canned pie filling was on the other side of pretty much every food boundary I have. First and foremost it’s a non-homemade route for baking, which I try to avoid. Second, it’s got to be loaded with high-fructose corn syrup and probably doesn’t have much real fruit in it anyway. Third, fruit pies aren’t my favorite. I’m a pumpkin girl all the way. As soon as I brought myself to pie filling level in front of the supermarket shelves (on the floor), Comstock surprised me. Some of the cans looked newer and were labeled “More Fruit” and “No high-fructose corn syrup”. What? Really? Huh, maybe this stuff isn’t that bad after all. I chose a can of Cherry “More Fruit” filling and immediately started thinking of how I was going to use it. Pie was too obvious. I wanted to make bread, sourdough bread to be specific. It struck me that the sweet, gooey fruit filling would be a perfectly odd partner for tangy, dense sourdough. 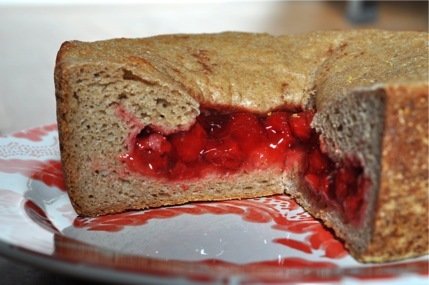 Thus, the cherry-filled sourdough loaf was born! 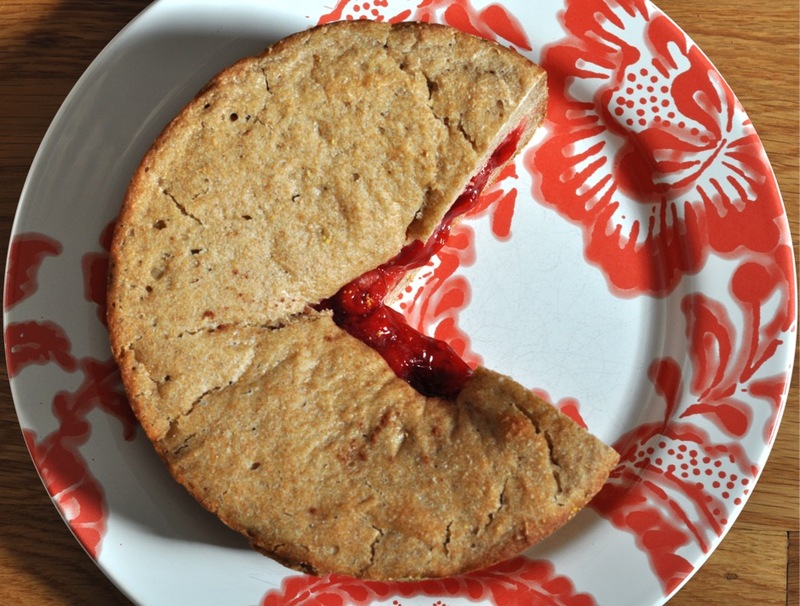 It may look like a cherry pie collided with a loaf of bread to produce this bizarre offspring. I like to imagine both things flying through the air in my kitchen…but that would be messy. Instead, I simply made a small batch of wet dough with my sourdough starter, layered half of it on the bottom of a round baking dish, poured in about half the can of fruit filling, and then made a ring around the edge of the filling with the remaining dough. After some more rising and some oven time, I had a sweet, doughy thing that I didn’t know how to eat. Fork? Hands? Hands won but it was messy. 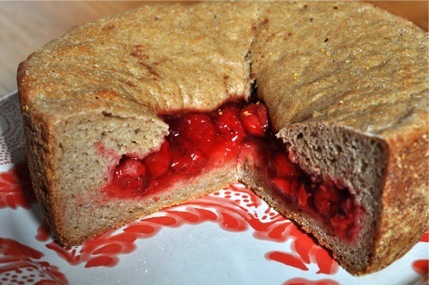 The sourdough is very sour (I used a lot of starter) and the cherries are very sweet. 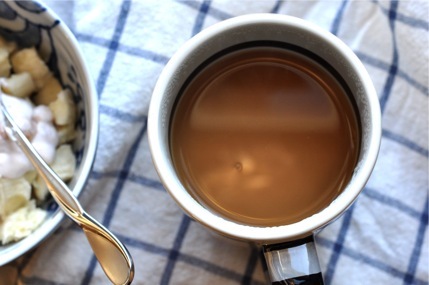 Together, though, they are the perfect winter breakfast or brunch flavors. One reason I chose the cherry filling was that cherries are no longer in season so I can’t actually make a cherry pie from scratch right now. That’s the perfect excuse for using a canned convenience food, in my opinion. Cherry pie filling is such a Christmasy color that it’s nice to have it around this time of year, even if it isn’t made from seasonal produce. This isn’t really a recipe, since I totally improvised the sourdough bread and I think everyone who makes sourdough has their own way of doing it. If you have a starter, make a whole grain dough with a high moisture content and open a can of pie filling. If you don’t have a starter, put it on your Christmas list! 1 batch of your favorite sourdough, made with a little less flour or more water so it’s wet enough to spread over the bottom of a pan. Prepare dough, allow it to rise once. Punch down. Coat the inside of a baking dish with oil and then stone-ground cornmeal, semolina flour, or regular flour. Divide dough in half and gently spread half of it over the bottom of the baking dish. Spoon about half of the can into the center of the dough in the dish, leaving at least an inch of dough around the edge of the filling. Lay the rest of the dough all the way around the edge of the filling so that it makes kind of a barricade between the fruit and the sides of the baking dish. Cover dish and allow bread to rise for another couple of hours, or until the top dough circle has expanded to almost cover the filling underneath. Preaheat oven to 425 degrees F. Bake bread for 25-30 minutes, or until it’s golden-brown on top and the edges have pulled away from the dish somewhat. Cool on a wire rack until the dish is no longer hot to the touch, and the fruit filling is somewhat set (not too liquidy). Then remove loaf from dish and continue to cool on rack. Slice like a pie and serve! The only thing that would have made this better is chocolate. Why didn’t I think to add chocolate? You could always spread some Nutella on each slice or sprinkle dark chocolate chips onto the bottom dough layer before adding the cherries. Now that would be decadent! That may look like the bubbly surface of a strange planet but it’s not. Wouldn’t it be nice if there was a planet entirely composed of coffee cake? 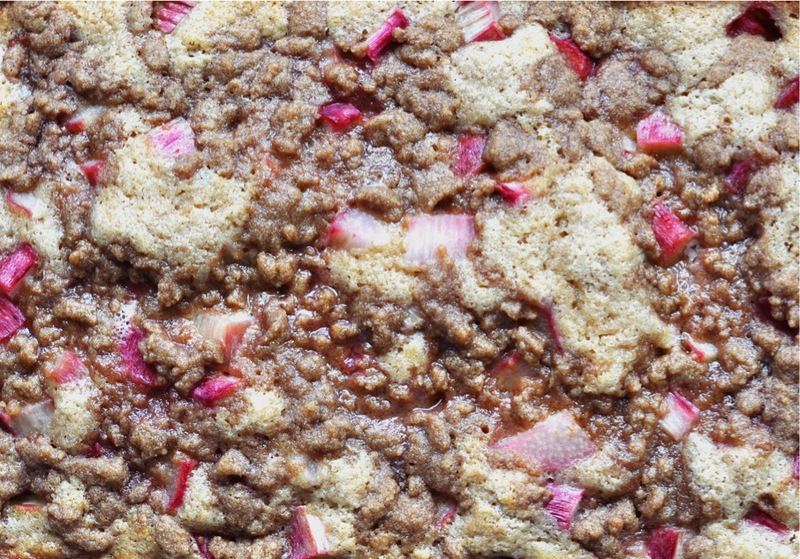 It would have a caky core rich with sourdough, a bubbly fruit layer, and a sweet, mottled crust of buttery crumbs. I’d live on that planet. Sorry for the random space reference. I guess I’ve been spending too much time in the science museum. It sure is nice to be back in museums, though! I’ve managed to snag and internship in one and a volunteer position in another. I’ll take all the unpaid experience I can get if it puts me in a situation to learn and network in my chosen field. 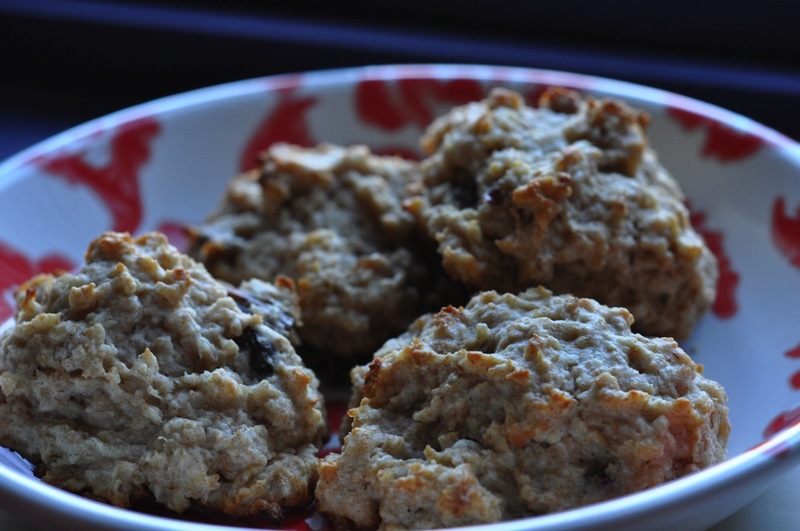 One of my chosen field’s, that is…baking/blogging being the other one. Okay, I’m dying to talk about this coffee cake. Could it look and more scrumptious? 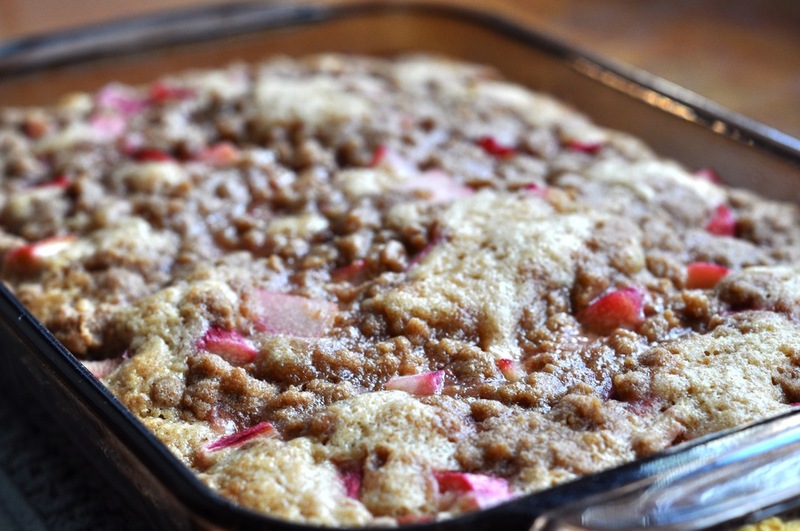 Maybe I’m just flabbergasted by it because I rarely make coffeecake and am unused to the beautiful, indulgent-looking breakfast/brunch/dessert (yes, you have my permission to eat this for all those meals). I say indulgent looking because this coffee cake isn’t going to make you feel like you just ate half a dozen doughnuts. There’s butter and sugar in there, for sure, but in much more modest amounts that you would think. Hey, there’s fruit too, any kind of fruit you want! The secret: sourdough starter! I’ve been experimenting with using my started in a few things other than crusty bread loaves and have been very pleased with the results so far. It seems to be a good replacement copious amounts of fat in recipes. This is the first blog-worthy product and it is more than worthy. This coffee cake stops time when you cut a slice, sit down with a fork and a cup of coffee, and push everything else aside. You can also just eat hunks of cake straight from the pan with your fingers. i’ve tried it both ways. 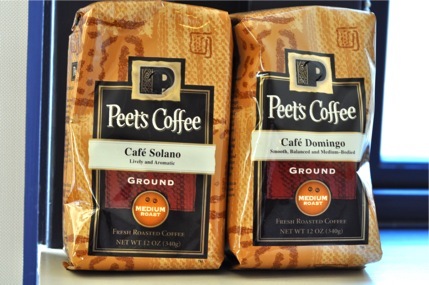 One reason I delved into the land of coffee cakes, where I do not often venture, is that Peet’s was kind enough to send me two bags of new medium roast ground coffees and a mug through the FoodBuzz Tastemakers program. I am in love with the first bag I opened, Cafe Solano, and have been enjoying it every morning with my cereal. Being the only coffee drinker in the house, I have a lot of brewing and sipping to do! Rest assured, fellow Peet’s fans, there will be more coffee-oriented posts to come! Really, the zippy Cafe Solano roast with “floral notes and a subtle fruit essence”, as Peet’s experts describe it, is perfect alongside this fruit-studded coffeecake, whichever kind of fruit you use. I was very happy to find that this medium roast coffee has intense flavor without being overpowering or bitter. There are places for dark and light roast coffee in the world but sometimes the middle is best. In a medium bowl, combine flour, sugar, baking powder, and salt. Stir till well blended. Cut in 1/4 cup butter until mixture resembles course meal. Separately, mix together sourdough started, beaten egg, and vanilla. Add went ingredients to dry, stirring until completely incorporated. Pour batter into a lightly oiled baking dish (I used an 11×7 dish). Evenly distribute fruit on top of batter. Mix topping in a small bowl, blending flour, cinnamon, and sugar, then cutting in butter. Bake at 350 degrees for 45-50 minutes, or until the edges of the cake are brown and the top is evenly cooked. 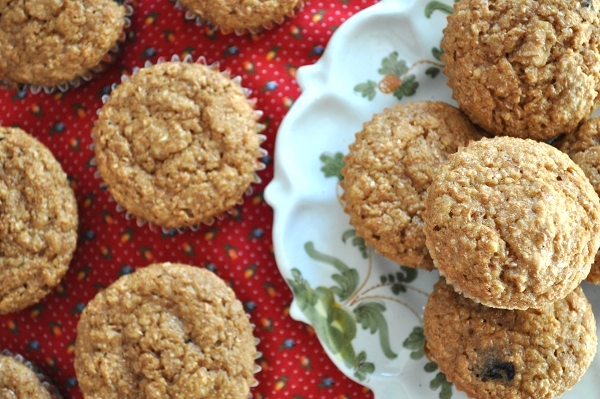 Bake a coffee cake, brew some coffee, and settle down with your goodies and a juicy book. Enjoy fall! Given the choice, I usually like to start with the bad news. I won’t bore you with my sad story, though, so today I’ll start with the good stuff! See those little brown peaks on the surface of these scones? Those are crispy mountains of buttery flavor and beneath them are melt-in-your-mouth soft, crumbly centers. All that texture and flavor came from only a small amount of butter and a generous glug of buttermilk! I don’t know what inspired me to buy buttermilk the other day but once it was in the fridge I had to find something to do with it. While scones may not be the obvious application I think they are my new reason to buy buttermilk. As a bath for chew oats and the main liquid ingredient in the scone batter, buttermilk is a winner with all it’s tangy richness. This was a totally spontaneous baking foray and I’m very happy with how it turned out. 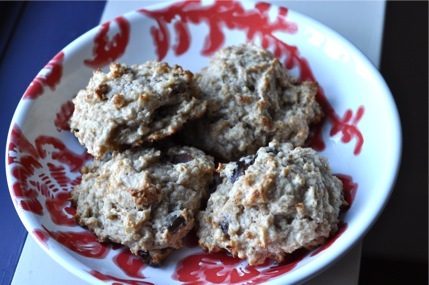 I think I’ll be making these scones over and over again with different mix-in combinations. Cherry chocolate chip is on the horizon! Combine oats and buttermilk in a medium-sized bowl and leave in the fridge for at least one hour. Thoroughly mix dry ingredients in a large bowl. Add butter in small pieces and cut it into the flour mixture using a pastry blender (two knives or a wire whisk work too). Stir chopped dates and agave (to taste, for desired sweetness) into the buttermilk and oats (you could also add the dates at the beginning of the soak time to soften them up). Add liquid ingredients to dry ingredients and stir until just blended. You might need to add a splash of milk to moisten things up (I did). 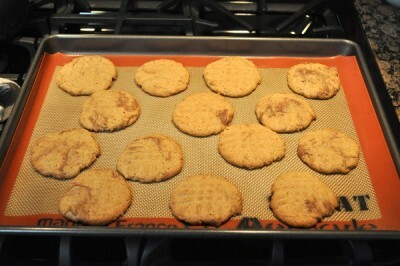 Spoon the batter onto a greased cookie sheet. Bake at 425 F. for 12-15 minutes, or until your scones have little brown peaks on top. I highly recommend eating one of these as soon as you take them out of the oven for the maximum buttery goodness! And now for the tragedy. I had a major screw up in my baking few mornings ago. I blame it on the 6 am body pump class that exhausted me to the point that I could not function normally for the rest of the day. I returned from class, ate a hearty cereal, yogurt, and fruit breakfast (of course there was coffee involved too), and prepared to make something with my happy, well-fed sourdough starter. I have been feeding my starter the night before baking with it. I mix up the sour contents of the jar in the back of my fridge and pour them into the GIANT bowl (with quite a history that I’ll get to later). Then, per my starter’s parent’s directions, I add a cup of all-purpose flour and a cup of water. After mixing thoroughly with a whisk, plastic wrap and a tea towel go on top of the bowl and I stash it away in a corner of the kitchen for the night. In the morning a cup of this mixture goes towards baking and the rest (or whatever fits in the jar) goes back in the fridge. This method has been working well for me. I fed my starter properly on the night before the incident but the next morning I skipped a step. I was so absorbed in weighing my flour and testing the water temperature that I completely forgot to remove all but one cup of the starter to save for future baking. My entire batch of starter was half-blended with white, wheat, and rye flour plus a dash of olive oil and some water before I realized what I’d done. It’s a good thing no one was around to hear me cry. I woefully slopped some dough in my starter jar, just in case it was salvageable. So far, that dough hunk’s future looks promising. I fed it a cup of water and half a cup of all purpose flour, then filled my jar and used the rest to make pizza crust last night. The crust rose beautifully and tasted fantastic! I’m crossing my fingers for my starter’s future.